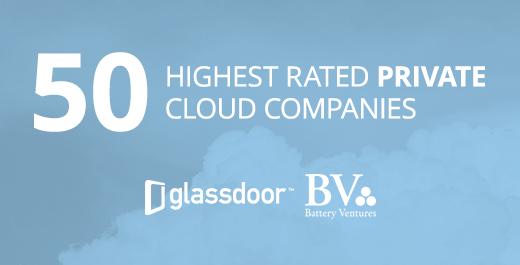 SILICON SLOPES, Utah — August 30, 2016 — Domo, provider of the world’s first cloud-based platform for business optimization, today announced that it has been named as one of the 50 Highest-Rated Private Cloud-Computing Companies to Work For by Glassdoor and Battery Ventures. The list recognizes cloud-computing companies where employees report the highest levels of work satisfaction. The project affirms that aside from cloud being one of the biggest technology trends and driving billions in revenue, cloud-based companies are also becoming great places to work. The project revealed that 87.6 percent of employees at the top-50 cloud companies felt positively about the future direction of the company, compared to the Glassdoor average of 45 percent. The CEOs of these companies also ranked highly with the average CEO-approval rating being 94 percent, compared to the Glassdoor average of 67 percent. Glassdoor and Battery Ventures data-intensive survey leveraged data from research service Mattermark and focused on larger startups with a B2B business model. The companies reviewed had to have more than 200 employees, more than 30 employee reviews on Glassdoor and raised funding in the last three years. This newest workplace honor for Domo adds to numerous accolades in the past 12 months for its workplace, technology, market potential and leadership. In 2016, Domo also won a Glassdoor Employee’s Choice Award for Best Places to Work For. For a full list of honors, please visit: https://www.domo.com/company/accolades. For more information about Domo’s one-of-a-kind culture or to apply for a career at Domo, visit: https://www.domo.com/company/careers.